It's make-or-break time for the Cramer-coined F.A.N.G. stocks this week as the last of the group reports earnings. Thus far, it's been we've seen mixed results from the high fliers — Facebook shares rallied to an all-time high after recording a revenue record. Meanwhile Amazon and Netflix shares fell a respective 8 percent and 5 percent in the days after their reports. According to one market watcher, Wall Street can expect an equally volatile move for Alphabet when it reports earnings Monday after the closing bell. "The options market is implying a $61 move to the upside or downside when Alphabet reports earnings," Todd Gordon told CNBC's "Trading Nation" on Friday. That's an 8 percent move in either direction. Gordon noted that in its last two earnings reports, the move has resulted in a gap higher. "If we get a positive report, or even if it's expected, I think you could see a big move to the upside," he added. Adding to his thesis is a relatively strong technical backdrop. Looking at a chart of Alphabet versus the Nasdaq, Gordon noted that despite a deteriorating broader market Alphabet shares have remained calm. "That's a sign of relative strength," the founder of TradingAnalysis.com said. Alphabet shares are up 2 percent in the last three months while the Nasdaq 100 has fallen 9 percent. 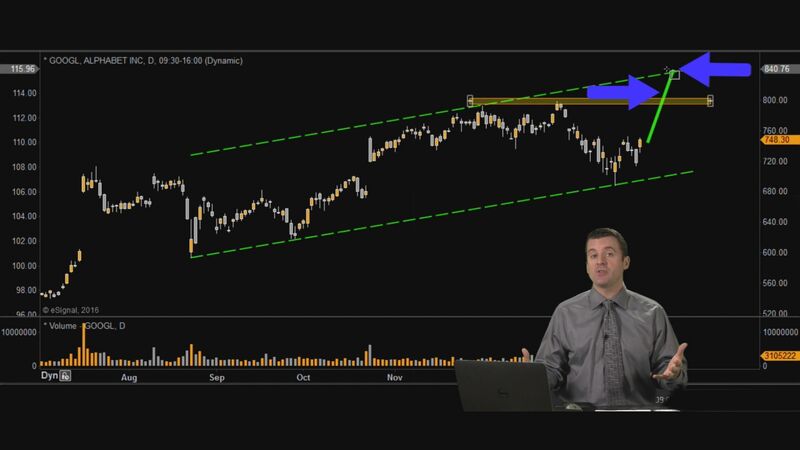 Gordon noted that the stock has been trading in a clear parallel uptrend channel. "You can see that [Alphabet] is clearly climbing the hill on that railroad track," he said. "The technicals are getting us up to about $840," said Gordon. That would put the stock above its December high. "The options market is implying a move up to the old highs, and I think we could exceed that," added Gordon. Wall Street analysts are expecting Alphabet to earn $8.09 per share on $16.9 billion in revenue in its fiscal 2015 fourth-quarter report, according to FactSet.